Moscon has a short, but intense history of bullying behavior. Last year Team Sky suspended the rider for racially abusing Kevin Reza at the Tour de Romandie. Shortly thereafter he was accused (but because there was no tape, it could not be proved) of causing Sebastien Reichenbach to crash because Moscon thought Recihenbach was responsible for making the Reza incident known. Now, he has punched Fortuneo-Samsic's Elie Gesbert early in stage 15. After a review of the video tape, Moscon was tossed from the Tour. Let's hope we see no more of the ever-violent Mr. Moscon. 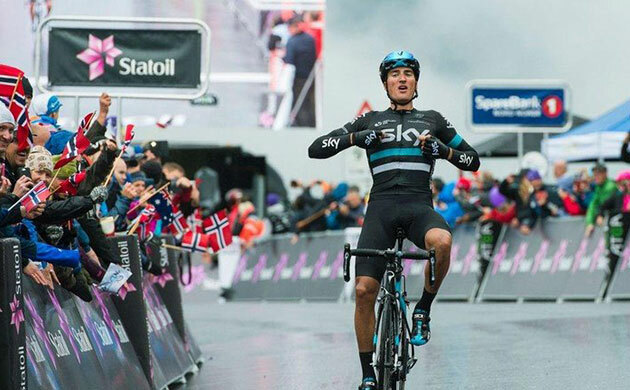 Gianni Moscon winning stage three of the 2016 Arctic race of Norway. Moscon was the final winner of that stage race. Team Sky Team Principal, Sir Dave Brailsford, said: "We support and accept the decision by the race organisers to exclude Gianni Moscon from the Tour de France. "It’s amazing! It was one of my biggest dreams when I’ve started riding a bike. This is my first Tour de France and I'm so happy to win a stage here. I want to thank my team for giving me a chance to ride this Tour. A special thank to Michael Valgren as well, who did an absolutely incredible job today, providing me with a huge support! Everything was just perfect today and our sports director Lars Michaelsen had great confidence in me for winning this stage. Many days ago we already discussed this stage and he told me it could suit me really well. So, today I went in a breakaway together with Michael Valgren and, finally, everything worked out perfectly. So, I'm very happy! ", explained Magnus Cort. Magnus Nielsen wins stage 15. Sirotti photo. Together with Michael Valgren, Magnus Cort became a part of a long-day breakaway at this stage 15 of the Tour de France (Millau – Carcassonne, 181 km). A huge selection in the break on the 1st category climb Pic de Nore. Both Astana riders were very active and, finally, made part of the leading group, which played for the stage victory. Inside the final 7 kilometers, Magnus Cort launched an attack from the break to go clear together with just two riders, Bauke Mollema and Ion Izagirre. At the finish line in Carcassonne, the Astana rider was the strongest, taking his first Tour stage win. "Yesterday we all were happy with the win of Omar Fraile and this gave me confidence that everything is possible for me in this Tour. In the final I tried to hold a big concentration on my rivals, because I knew someone could attack. I was pretty sure in my sprint, but there's always a risk that someone would try to do something before the finish. So, I was able to response to all the attacks and to go for a sprint", added Magnus Cort. After doing a great job and closing all the attacks of the rivals, Michael Valgren finished fourth. "I’m really happy for Magnus, I think we showed some great teamwork, as we made the right decisions on the right moments. We both felt very strong on the final climb, and after I gave it all it was Magnus who was able to jump with two very good climbers. And when we slowed down in the chasing group, I knew he could finish it. Yesterday, Omar Fraile showed us how to do it, it’s great that we now won two stages in a row with our team", said Michael Valgren. The peloton finished calmly on 13 minutes and 11 seconds behind Magnus Cort, Jakob Fuglsang and all other Astana riders crossed the line safely in the group. 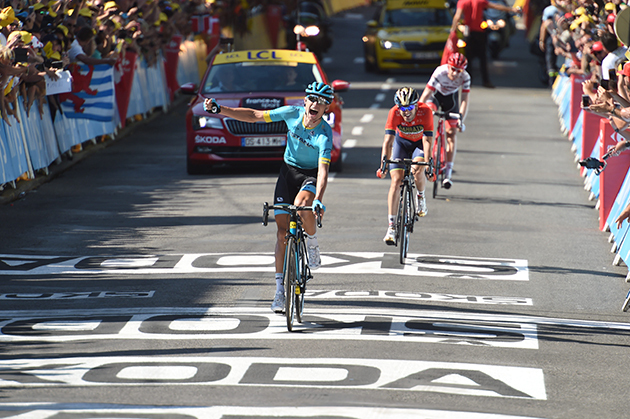 After stage 15, Fuglsang still holds his ninth position in the general classification of the Tour de France. "Before the Tour de France I already talked with Magnus Cort about a chance to win this victory, and yesterday I repeated this once more, to be sure he would be focussed for today. The guys did a great job and showed some intelligent tactics. Before the Tour we already focussed on stage 14 and 15, and to win them both is what we hoped for, but it’s amazing to see how everything comes together on these days. These victories are real team victories. From the riders on their bikes, but also from all the staff involved in preparing them for the biggest stage race in the world", said sport director Lars Michaelsen. Tomorrow is the second rest day of the race. It was a big day for BORA-hansgrohe in the break today, with three riders jumping in the escape. The UCI World Champion, Peter Sagan, Pawel Poljanski and Rafał Majka made their move early on, with Peter grabbing more points in the intermediate sprint, then going on to protect Rafał before he went on the attack on the day’s final climb. While the Polish rider was reeled in ahead of the line, he was awarded the day’s combativity prize for his bold attack over the top of the Pic de Nore. Finishing safely with the bunch and having already broken the record for the most days in the Green Jersey earlier in the Tour, Peter Sagan climbed onto the podium to accept his 100th Maillot Vert. There was just one stage remaining before the Tour de France’s second – and final – rest day, and today was another day where the victory could go to anyone. At 181.5km, it wasn’t the longest stage of the Tour, but it did have three categorised climbs to get over, each evenly spaced throughout the day, increasing in difficulty with each ascent. The third category Côte de Luzençon would be a good warm up after 9km, while the second category Col de Sié would get the heart pumping with its 4.9% average gradient over 10.2km, but by the time the riders reached the first category Pic de Nore, only the strongest would still be in contention over its 12.3km with an average gradient of 6.3%. The first half would be the hardest, with ramps hitting more than 9%, while the easier second half would be welcome, it would be hard for the climbers to settle into a rhythm, especially with the slight kick upwards at the end. For riders who had dropped back on the climb, a long descent before a flat finale might still give those less able climbers a chance to catch up to contest the finish. The long descent before the finale meant it was likely some teams would be aiming to get riders in a break before bridging to them later in the day, so with this possible, a big break was expected today. BORA-hansgrohe would try to have Lukas and or Gregor in the break, while Peter might also jump in the break too in order to go for some points at the intermediate sprint at 121.5km. The difficult last climb meant a split was likely, but the long descent would give anyone who was distanced a chance to come back, but the last climb could also be a great springboard for an attack, so the aim would either be to respond to this and close it down – or even to be in it. It took some time for a break to form today, with Gregor Mühlberger one of many riders trying to make their escape. With every one reeled back in, the descent on the other side of the Côte de Luzençon made it harder for another attack to stick. Finally, a huge group of twenty-nine went off, and there was no way the peloton was going to stop this one. BORA-hansgrohe were well-represented in this move, with UCI World Champion, Peter Sagan, Rafał Majka and Pawel Poljanski among their number. With no-one to threaten the GC standings in the escape, the peloton let this bunch build up an advantage that hit nearly thirteen minutes at its peak. Two riders had attacked off the front of this group, denying Peter the top spot in the intermediate sprint, but pushing to take first from the bunch, the Slovak rider took a further 15 points to add to his total. Having taken the points here, Peter went on to keep the attacks within the break under control as the breakaway approached the Pic de Nore – the day’s final climb. With 48km to go, and just as the gradient lessened, Rafał attacked to bridge to the solo rider on the front – and passed him. Alone on the front and the long descent ahead of him, the Polish rider pushed on, holding a slim advantage over the chasers. Behind him, the break fell apart on the final climb, just leaving a small group to try and make the catch. At 14km to go, Rafał was caught by a group of seven, but rather than slide off the back, he fought on and chased the attacks to try and stay in touch, but in the end his efforts on the final climb and his solo ride on the front meant he just didn’t have the energy. While a group of three sprinted for the win, Rafał came home in 8th spot, and was awarded the day’s combativity prize for his strong efforts. 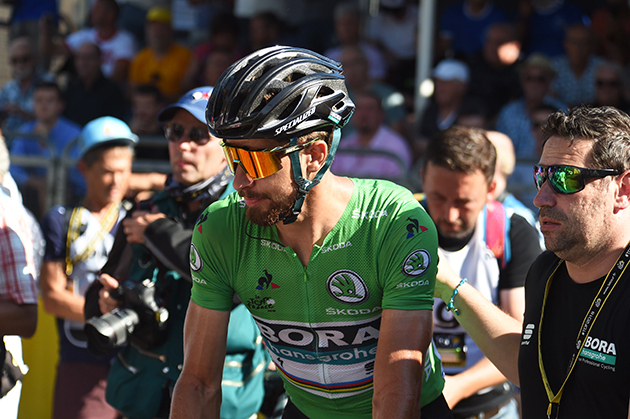 Finishing safely with the bunch, Peter Sagan confirmed his unprecedented 100th Maillot Vert. 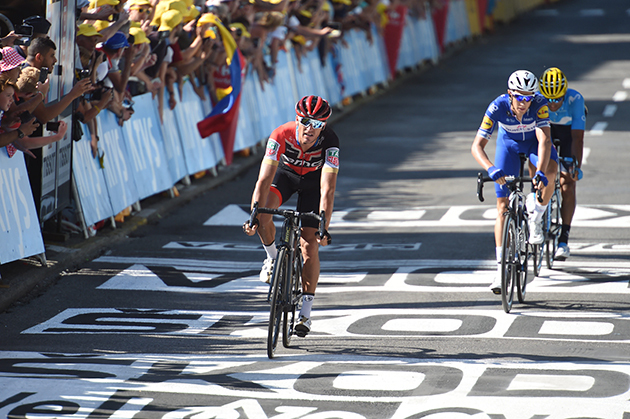 22 July, 2018, Carcassonne (FRA): Greg Van Avermaet was back on the attack at the Tour de France on stage 15 today and showed that he is still in good form heading into the second rest day by riding as part of the breakaway before narrowly missing out on a top ten finish. The 181.5km stage started with three short but sharp climbs heading away from Millau, including the category three Côte de Luzançon, and this set the race up for a fierce battle to make the breakaway. Tejay van Garderen was active on the front, both chasing down moves and attacking, before a trio of riders was able to extend a narrow advantage after 20km of racing. In the midst of all the excitement, the peloton split in two with over 40 riders losing contact as up ahead the main bunch was closing in on the front group with the catch made 15km after the initial attack. In the end, it was a large 29-rider breakaway, which included Van Avermaet for the second consecutive day, that was finally able to go clear and with the pace easing behind, the second part of the peloton was able to make contact once again. Greg van Avermaet finishes stage fifteen. On the early slopes of the 10.2km long category two Col de Sié, the advantage of Van Avermaet and his fellow leaders had passed the four-minute mark as Lilian Calmejane (Direct Énergie) decided to go solo at the front of the race. At the summit of the climb, the lone leader was sitting one minute ahead of the first chasing group while the peloton, seemingly unfazed by the composition of the breakaway, was another five minutes back. The road then rolled down towards the base of the category one Pic de Nore, the day's final climb which at 12.3km long had an average gradient of 6.3% and pitches of over 9%. By this point, Calmejane had been caught by the rest of the breakaway and Julien Bernard (Cofidis) and Fabien Grellier (Direct Énergie) were trying their luck 1'45" up the road and with a relaxed peloton almost 14 minutes back, it was evident that the stage win would go to a rider at the front of the race. Van Avermaet continued to work hard on the slopes of the climb but the subsequent increase in pace combined with the gradient soon began to take its toll, and he slipped off the back of the chasing group as it splintered behind the leading duo. A reshuffle saw Rafal Majka (BORA-hansgrohe) alone at the KOM with 41.5km to go before a group of seven joined him after a fast descent towards the finish line in Carcassonne with Magnus Cort Nielsen (Astana Pro Team) going on to take the day's honors ahead of Ion Izaguirre (Bahrain Merida Pro Cycling Team) and Bauke Mollema (Trek-Segafredo). After riding his own tempo in the closing stages of the day, Van Avermaet narrowly missed a crash going onto the home straight and finished just outside the top ten in 11th place, 2'30" back, which saw him move up into 15th on the General Classification. Damiano Caruso, who now sits 18th overall, and van Garderen crossed the line over 13 minutes behind the stage winner in the yellow jersey group. "I actually felt pretty good today when I went into the breakaway. I felt better than yesterday and although it was hard to make the breakaway, I was happy to be in it. I think the final climb was just a little bit too hard again and with the energy I have already spent this week, it was hard to keep up with the good guys. I tried to set as good a tempo as possible and then tried to come back in the descent. However, the strongest guys were already gone and that was a bit of a pity. But, that's how racing goes." "The second part of the Tour has been pretty good for me. I have been trying and have had a couple of good finishes and been in the breakaway. I think I am in good shape but you also have to have a parcours that fits your style and with the energy I have had to spend, maybe I missed something in the end to really go for the win. But, I think the rest day will be good for me and hopefully, I can recharge a bit and get another chance." 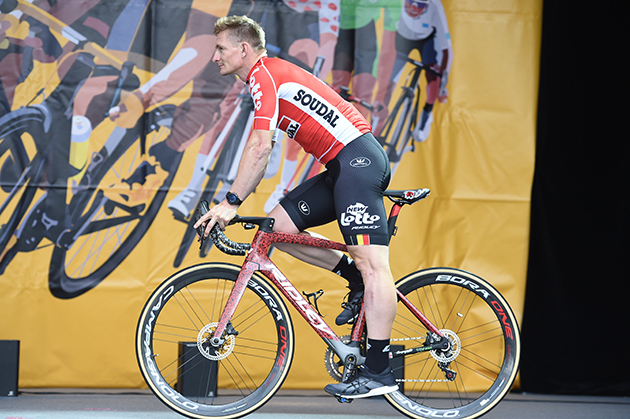 Lotto Soudal and André Greipel want to inform you that after eight successful years, their collaboration comes to an end. Once André has announced his plans for the future, both André and the team will be available to give more explanation. André Greipel at the Tour team presentation ceremony earlier this month.